Maybe you are looking forward to give your trusty reading tablet away, or selling it. 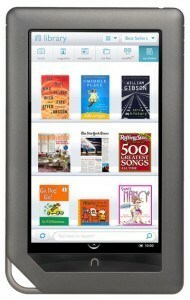 Maybe you fell your Nook Color is acting up, slugish, or it is hopelessly filled up with installed apps and games. The following instructions will guide you into performing a hard reset on your Nook Color. A Hard reset on your reading tablet will turn it into it’s factory default state. This will de-register you as the owner and account holder of your nook color, along with every other personalized information including downloaded books, magazines, Apps and games. You need to start this procedure with your Nook Color turned off. Press and hold the “n” button (located below the screen, in centered position), press and hold the “Volume Up” button and press and hold the “Power” button. Wait while the Nook Color boots up in its service factory reset menu. Depress the three buttons. When asked for confirmation, press again the “n” button. It will take some seconds for your Nook Color to erase all your data.